The first textile-printing technique was using blocks, which were inked and then pressed on to the fabric. The image from a single block builds up into a proper design over the fabric area. Some first blocks were made of clay or terracotta, others of carved wood. Wooden blocks carrying design motifs were found in tombs in the ancient towns in Upper Egypt. A combination of block printing and painting was used for some time. The typical hand block print had no large, uniform areas of colour but was expertly built up from many small coloured areas, because wooden surfaces larger than about 10 mm in width would not allow an even print. This had the advantage that a motif such as a flower would have an effect of light shade obtained from three or four blocks, each printing a various depth of the same colour or shade. 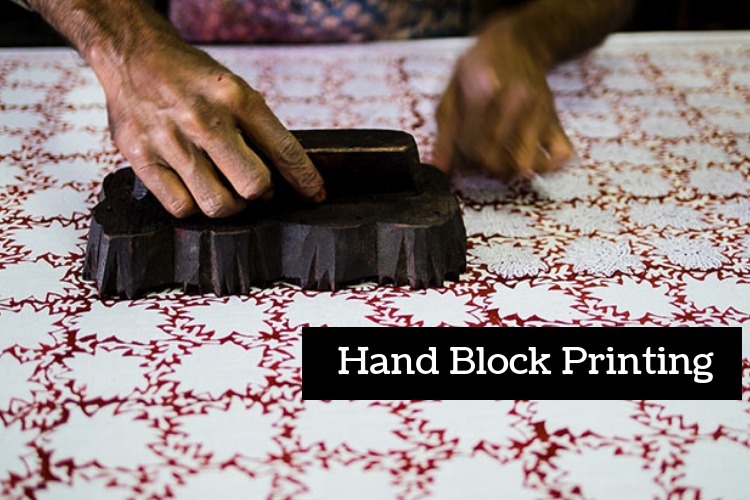 Here are some different styles of block printing. In this technique, before the printing is carried out first, the fabric is dyed to desired colour, and the dye is to be removed at selected places by chlorine or other colour destroying chemicals from the part of the fabric where the design is to be printed. Coloured patterns on a dyed ground are possible in this method by including the bleaching paste a dye not affected by the bleaching agent used, so that another colour is substituted for white on the dyed ground. The fabric is first bleached and then dyed with right colour. Then after, the hand block printing is done with carved wooden blocks in borders and in the inside of the fabric. In resist printing, the design needed is printed on the fabric with a material which will resist dyeing. The fabric is then dyed with right colour. Washing after dyeing removes the resist material in which design is printed leaving a white pattern like the following print effect is attained on the fabric.